Foodie or not, if you live in Dallas, you have probably been to one of Kent Rathbun’s restaurants. And if you read Dallas Observer, you have probably read about Rathbun’s ongoing legal battle with a former business partner, which involves the right to use Rathbun’s name and likeness in the restaurant industry. If not, this D Magazine article can you fill you in on why Rathbun’s name is a big deal, and this Dallas Observer article can catch you up on the acrimonious relationship and the arising legal woes. While the case is ongoing, this past Friday, the Dallas Court of Appeals issued a ruling in Rathbun’s favor on the basis of the “unclean hands” defense, which is often alleged, but rarely supported, in non-competition disputes. By way of background, back in 2009, Rathbun assigned the rights to his name and likeness to an entity he co-owned with his then-business partner. After they parted ways, Rathubun filed a lawsuit seeking a declaration from the Court that the assignment was a “covenant not to compete” and was unenforceable because it failed to comply with the requirements of the Texas Covenants Not to Compete Act (see my previous post on the requirements here). In response, the former partner sought an injunction from the Court prohibiting Rathbun from using his name or likeness while the parties litigated their dispute based on the assignment agreement. During the temporary injunction hearing, Rathbun introduced (1) deposition testimony of his former business partner regarding his knowledge of Rathbun’s lack of business sophistication and his fiduciary duties owed to Rathbun and (2) deposition testimony that the company to which Rathbun assigned the rights to his name might have assumed some liabilities without full disclosure to Rathbun, even though he was a part-owner at that time. The trial court denied the injunction, allowing Rathbun to keep using his name as long as he did not disparage his former partner, and the Dallas Court of Appeals upheld the denial. While it refused to consider whether the assignment agreement was a “covenant not to compete” covered by the Texas Covenants Not to Compete Act, it did find that the deposition testimony described above presented sufficient evidence to support the “unclean hands” defense asserted by Rathbun. The unclean hands defense “allows a court to decline to grant equitable relief, such as an injunction, to a party whose conduct in connection with the same matter or transaction has been unconscientious, unjust, or marked by a want of good faith, or one who has violated the principles of equity and righteous dealing.” Here, the Court found that there was some evidence that the company that was now trying to enforce the assignment acted inequitably when it failed to fully disclose to Rathbun that it had assumed certain liabilities, which burdened him as a part-owner of the company. Consequently, its unclean hands prevented it from obtaining an injunction against Rathbun. BOTTOM LINE: While the Court of Appeals’ ruling in this case is not a final decision on the merits of this defense and can still be appealed to the Texas Supreme Court, it does provide a glimpse into what type of behavior by a party who seeks an injunction may rise to the level of “unclean hands” such that the party is prevented from getting injunctive relief. Companies should be aware that when they seeks to enforce a non-compete agreement, their own behavior can often be scrutinized for any signs of unfair or bad faith conduct that may be used to deny the injunctive relief. When it comes to enforcing non-compete agreements, companies usually want to stop the bleeding right away. This is usually done by obtaining a temporary injunction in court, which preserves the status quo and prevents the departed employee from competing with the former employer while the parties sort out whether the agreement is enforceable against that employee, whether its restraints are reasonable, and what damage has been caused by the employee’s competition in violation of the non-compete agreement. For those companies that have arbitration agreements with their employees, a noncompete violation will usually have to be arbitrated. 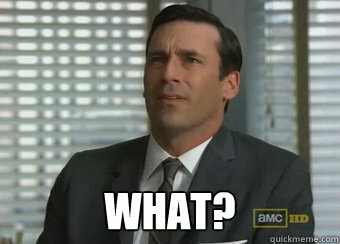 And while an arbitration may generally provide a faster, cheaper, and more confidential route for resolving a noncompete dispute than litigation, it can be an inferior process when it comes to obtaining a temporary injunction in a situation where time is of the essence. While the relevant arbitration rules usually allow an arbitrator to grant a temporary injunction or enter some sort of preliminary relief, a company that wishes to obtain such relief must first select an arbitrator and then schedule a hearing. These steps can result in a loss of precious time – days or weeks during which the departed employee has the time to ramp up the competition, destroy relevant evidence and cover his tracks. In contrast, the same company may obtain a temporary restraining order in court the same day it files a suit to enforce the non-compete agreement. For that reason, every arbitration agreement should have a carve out for injunctive relief – the clause that allows a company to obtain a temporary restraining order as soon as it learns of a violation of the non-compete agreement. Once the company has the court order in hand, it may safely proceed with an arbitration and take its time to investigate the violation and lay out its case. Does the company arbitration agreement have the necessary language to allow the company to obtain a temporary relief in court? Will the company be waiving the arbitration clause by obtaining emergency relief in court? Hint: A recent case from the Houston Court of Appeals held that seeking injunctive relief in court does not waive an arbitration clause if its purpose is to simply preserve the status quo. See Fisher v. Carlile, et al. Should the company file a claim of arbitration first and then seek an injunction in court or vice versa? 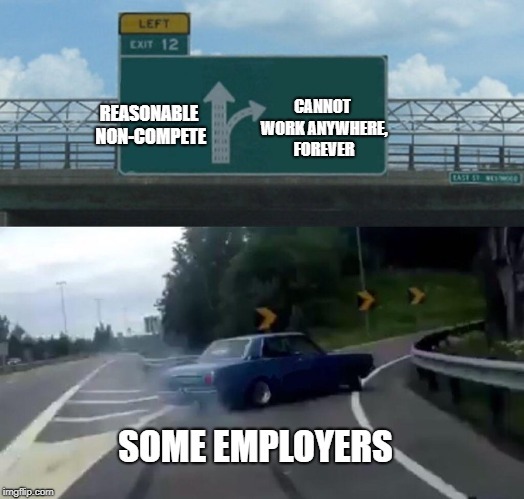 For an employer to enforce its noncompete agreement in a Texas court, it must show that it gave something to an employee in return for that employee’s promise not to compete. That “something” may differ from state to state. Some states want the employer to pay an employee $$$ for the specific promise not to compete. Other states find that just a simple promise of a employment, even the kind that can be terminated at any time, is an even exchange for an employee’s promise not to compete. Unlike many other states, Texas requires employers to give something more besides a job offer or money to an employee in order to extract a legally binding promise not to compete. In this state, the consideration must have a “reasonable relationship” to the employer’s interest in restraining the employee from competing. Simply restricting an employee from lawful competition for the sake of preventing competition will almost certainly fail. BOTTOM LINE: Texas employers should make sure that their non-compete agreements are supported by proper consideration under Texas law in order to enforce such agreements in court. 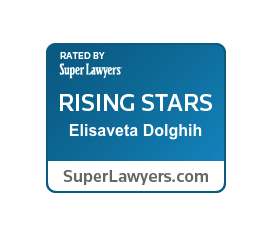 Leiza litigates non-compete and trade secrets lawsuits in a variety of industries. If you are a party to a dispute involving a noncompete agreement in Texas, contact Leiza at Leiza.Dolghih@lewisbrisbois.com or (214) 722-7108. The Fort Worth Court of Appeals recently upheld an injunction enforcing an 18-month, 50-mile non-compete against a veterinarian, who accepted a job with a competing veterinary clinic within the 50-mile radius of her former employer. In Bellefuille v. Equine Sports Medicine & Surgery, Weatherford Division, PLLC (ESMS), the veterinary resident signed a non-compete and non-disclosure agreement with ESMS, which prohibited her from competing with the company within a 50-mile radius within 18 months after her residence ended. The agreement also prohibited her from using or disclosing ESMS’s confidential information. When Bellefuille was told by ESMS that she would not get a job offer after her residency ended, she accepted a job offer with ESMS’s biggest competitor within the non-compete’s geographic area. There, she proceeded to treat some of the same animals she had previously treated at ESMS. After accepting the new job, the vet filed a lawsuit asking a court to declare her non-compete with ESMS unenforceable and/or that her new employment did not violate that non-compete. ESMS counterclaimed and applied for a temporary injunction order, which the trial court granted and ordered Bellefuille not to compete with ESMS or use its confidential information. The vet appealed, arguing that the injunction was overbroad, but the Fort Worth Court of Appeals found that the trial court’s injunction was proper after striking some language as being too overbroad and vague because it did not trace the language used in the non-compete agreement. Takeaway: There is no magic formula for enforcement of non-competes in Texas. The statute simply says that the restraints must be “reasonable” and no greater than is necessary to protect a legitimate business interest. 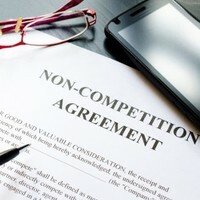 However, what is a reasonable term or a geographic area for a non-compete varies from case to case and depends on many factors, including, but not limited to, the nature of the business, the industry in which the business operates, the type of job performed by the individual subject to the non-compete, whether other employees have non-compete agreements, and many other factors. In this case, the length of the vet’s employment and the specific language of the restrictions played an important role in the court’s decision to enforce the agreement. A recent case from a Texas Court of Appeals demonstrates that the Texas non-compete statute applies not only to the employment agreements or sale of business contracts, but to any contracts that contain provisions restraining trade. In Wharton Physician Services, P.A. v. Signature Gulf Coast Hospital, L.P., the Corpus Christi Court of Appeals found that a liquidated damages clause in a recruiting contract was unenforceable under the Texas non-compete statute. If this Agreement is terminated by either party for any reason, then HOSPITAL [Gulf Coast] shall have the right to contract directly with all or some of the Hospitalist Physicians retained by GROUP [Wharton] to perform the services required by the terms of this Agreement . . . In the event that HOSPITAL, or any individual or entity otherwise affiliated with HOSPITAL, for work or services that would be provided at HOSPITAL, desires to contract directly with one or more of the HOSPITALIST physicians previously recruited retained, and presented to HOSPITAL by GROUP for hospitalist services at any time during the six (6) months period following the termination of this Agreement, HOSPTIAL shall pay to GROUP as liquidated damages in amount of $100,000 per physician. In sum, the court construed the liquidated damages clause “as a way to limit competition to Wharton from another company providing similar services.” As such, it had to comply with the Texas Covenants Not to Compete Act’s requirements, which it failed to do. Takeaway: When entering into a contract in Texas, the parties should consider whether any contract provisions may be viewed as a restraint on competition and an attempt to enhance or maintain prices. If that’s the case, then such contractual provision might have to comply with the Texas non-compete requirements in order to be enforceable.